For Wenzhou natives, Shunfenglou has, for over 35 years, been a byword for home-style cooking and wok-seared seafood. Its second-generation owners, however, spotted an opportunity to modernise the brand. 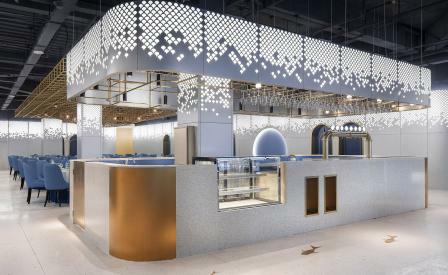 The blue-on-blue interiors – lined with undulating gold waves, abstract fish-scales cut into perforated aluminium panels, and flashes of brass and silver around the door frames of the VIP private dining rooms – were conceived by Topos Design Clans, the Shanghai-based designers semaphoring a distinct aquatic theme, but, save for the shoals of copper fish decals on the terrazzo floor, avoiding overly literal tropes.